Some residents in University City are protesting the possible loss of 55 trees that line the Ackert Walkway between The Loop and Washington University. 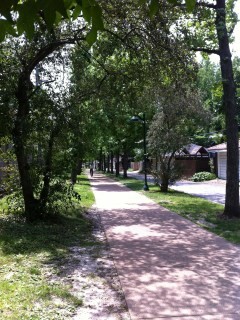 The university and Great River Greenways would like to improve the trail, in particular by widening it from 8 ft to 10 ft. The large sweet gum trees that currently line the trail, disliked by some for the spiky gum balls they drop, would be replaced with 80 new trees of varying species that are less apt to litter the pathway. I’m sympathetic to the residents fighting to preserve the trees. The trees are mature and, to my untrained eyes, appear very healthy. Mature trees provide much more shade and soak up much much more carbon dioxide than new trees. However, I support the argument to widen the path given the volume of pedestrians and bicyclists that utilize it. Designed appropriately, I believe this section of the Ackert Walkway could become much improved from everyone’s perspective. Unfortunately, WU and GRG have already somewhat botched the pathway design both north and south of this section of trail. Hopefully, they won’t botch this section, as well.